Did your family live in Irish Castles? I often get asked – “did my family own Irish Castles?” It’s the ultimate fairy tale – Kings, Queens, Princes and Princesses all living in beautiful old castles. Castledonovan in County Cork – an O’Donovan Castle. Between the early 13th century and the late 16th century – about 1400 castles and towerhouses were built across the island of Ireland. First built by the Normans – and then copied by the Irish Chieftains and lords. According to my reseach – the following are the family names in Ireland during this time who built a castle/towerhouse. Many are still standing and even lived in. Some are ruins – and some more are reduced to just a site. Is your family name here? Agnew, Archer, Archibold, D’Arcy, Aston, Audley, Baggot, Balfour, O’Bannon, Barrett, Barry, Bellew, Bellingham, Bermingham, Bissett, Blake, Blennerhassett, Bouchier, Boyle, O’Boyle, Brabazon, Brady, MacBrien, O’Brien, Briscoe, Brown, Browne, Brunker, Burke, Butler, O’Byrne, O’Cahan (Kane), O’Cahill, O’Callaghan, Campion, Cantillon, Cantwell, Carew, O’Carroll, McCarthy, O’Casey, Caulfield, Cheevers, MacClancy, O’Clery, Cloghessy, Codd, Cogan, Cole, Condon, O’Connor, Cope, Coppinger, Costello, Cotter, DeCourcey, McCoughlan, Coyne, Creagh, Creighton, O’Crowley, Cuffe and Cusack. Carrigaphooca, County Cork – a McCarthy Castle. Parsons, Phelan, Phillips, Plunkett, Power, Prendergast, Purcell, McQuillan, Quinn, Redmond, O’Reilly, Reynolds, Roche, Rocheford, O’Rourke, Rushe, Russell, Ryan, Savage, O’Shaughnessy, Shaw, O’Shea, McSheedy, MacSheehy, Shortall, Sinnott, Stewart, O’Sullivan, Supple, Sutton, MacSweeney, Sweetman, Taafe, Talbot, Tierney, Tobin, Troy, Tuitte, Tyrell, Wall, Walsh, Whelehan and White. Hello I’m wondering if the Kavanagh residence is Borris House or if there is also another major dwelling. Thank you- Tim Cavanaugh. Hi Tim – Borris would be the main residence, but also check out the older Ballyloo castle, Ballyloughan castle, Rathnageeragh castle. Mike. I see my Dad’s family O’Daly is listed as having a castle. I was told they were from County Galway or Kerry. Is this correct and do you have any other info that can you give me? Judy – Dalys are also from Cork, Clare and Westmeath. Mike. Regarding where the O’Dalys are from, the earliest record of the surname is a poet who died in AD 1139 in Co. Westmeath, although the surname itself derives supposedly from a sixth-century poet (Dalach) who was the sept’s common ancestor. Early after 1139 the family appears to have dispersed to many parts of Ireland, often working as poets to leading families such as the O’Mahonys and MacCarthys – I suppose they went where the work was! Branches were established in counties including Kerry, Meath, Cavan, Galway and Clare. There’s also a detailed 600+ page history of the family called ‘The History of the O’Dalys’ which was privately published in the US in 1937, but the book has now been made available online if you’re interested in reading more. 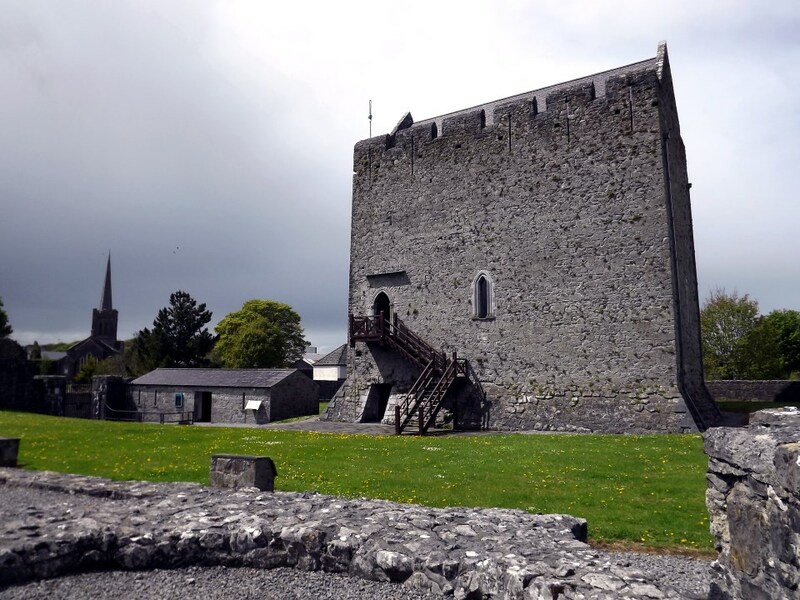 The O’Dalys were connected with a few castles including Castle Daly in Loughrea Co. Galway (now a ruin), Raford House and Killimer Castle (Killimordaly), both in Co. Galway and Ferrananamanagh Castle (a tower house) in (I think) Co. Cork. I noticed on your listing about that my mothers name is on the list “Walsh”. Where can I find information on where the Walsh castle is/was? Do you know the county that they were from. I was told Cork but do not know that for sure. Hi Al – Walshes come from all over! It originally means “man from Wales” so all Walshes typically came through county Wexford from the 1100s onwards as part of the Norman invasion. They built castles in the Wexford area – but you will now find Walshes all over the country – Cork, Galway, Mayo etc. Mike. Hi Melissa – I haven’t come across the name Counterman in my research. Did your folks originally come from Ireland? Mike. Now Kris – is it on your todo list to buy the castle? 😉 Kilkea was one of the earliest castles – incredible to see it still in use! Mike. My daughter and granddaughters thought it would be a good idea! Then they could be real princesses!!! I’d give them a week Kris – then they’d be hankering for the modern comforts 😉 Mike. The O’Maddens Owned Cloghan, and a few other of the old castles around Ireland. The name was, O’Madaidhin, which meant Hound or Mastiff. The story of what happened to my ancestors at Cloghan, is not a pretty one, but one worth the telling. My people immigrated to America in 1882, by way of England. I suppose they just needed to raise the funds, before they could book passage to the States! I’ve always wanted to come to Ireland, and someday soon, I will. It’s as though I’ve always been homesick for the place, even though I’ve never yet been there. That’s right Jacqueline – the O’Maddens were a significant sept of the Uí Maine in east Galway. Hope you manage to get there sometime! Mike. I am a decendant of the O’Madden clan. It is a very interesting history & ancestory. Hi Colleen – thanks for the feedback. Have a google for Ballyadams castle in county Laois. It’s a ruin – but a very nice one! Mike. hi there! We just visited “our” castle in Dromagh, Co Cork, aka the O’Keefe Castle. It’s a beautiful place, but in serious disrepair and basically used as a chicken coop and garage. I posted a pic on the FB page. Any ideas how I could find the history? It’s owned today by the O’Leary’s who are a retired couple that live next door in their old B&B. Hi John – I posted your pic with comments and a link to some background at http://www.facebook.com/youririshheritage Thanks, Mike. Hello! I would love to know if anyone could tell me where some or most of the Donovan and Sullivan castles are located? Thanks for a very interesting website. Hi Tracey – Cork and Kerry for both names. You could look up Dunboyne castle for O’Sullivan and Castledonovan for O’Donovan. Mike. I noticed quite a few of my families name here!! Fleming, O’Hare, McCarthy, and White. Can you tell me more about the clans and where they are from and if there are any castles by them. Legend has it in family folklore that the Lavin family was from royalty. Fleming – Norman – Meath plus all over. O’Hare – can be English or from the County Louth area. McCarthy – Kings of Munster – see Blarney Castle for a castle. White – usually an English name in Ireland from the 1300s. All the best – Mike. I don’t see Colley on your site even though we’ve been there for centuries, represented Ireland in both the Irish Parliament and English. We are the paternal lineage of the 1st Duke of Wellington, Irish born British General Arthur Wellesly credited with defeating Napoleon at Waterloo. His grandfather a Colley took the name Wellesly to inherit the title and lands of his wife’s cousin. Any chance you’ll be adding us soon? Thanks for sharing Ronald. And now – given that you have shared your story around the name Colley – it should be available to all in the future on the site. Thats how it works – we build things up slowly as we go through conversation. Of course as well as the English Colleys who came to Ireland in the 1500s – there is also the Gaelic Colleys from Roscommon/Galway. Mike. Gaelic Colley’s maybe went to Briton to return in the 1500’s I hope, as here in the states we Colley’s do tend to embrace our Irish connection and ignore English? 2. A Gaelic name of MacColla from Roscommon/Galway – anglicised as Colley. So, there’s your choice! All the best, Mike. Upon additional searching I’m told the Anglicized form of Colley in Ireland also came from “Mac Amhalghaidh” in Westmeath. Does that sound accurate as well? That looks correct Ronald! Mike. My family name “russell” appears on the list for families that built castles in ireland. I was wondering if you might be able to tell me where the russell’s built their castle? And if it is still standing. Hi Phil – yep – that would be Seatown Castle in malahide, North County Dublin. The castle has been incorporated into later dwellings. Have a look here: http://www.eneclann.ie/exhibitions/tomcruise/who-were-the-russell-family/ ~Mike. I beleive my McDermott family comes for the Letrim area but when researching the first member I found was in Ballymagreehan, Co down about 1870.. I am wondering if this family move happend do the the famine. Any ideas on how to research more on them. I know from Ballymagreehan they move to Belfast. When doing a search I did find MacDermtts Castle in Lough Key Co. Roscommon not Letrim ??? Thanks for sharing Madilyn – on your specific question I suggest you contact Noreen http://www.facebook.com/Hiberniaroots – she should point you in the right direction. Tell her I sent you! The McDermotts were from the Roscommon area of Moylurg originally and wandered west to Sligo over time. You might want to check out the book: “Mac Dermot of Moylurg: The Story of a Connacht Family”, Dermot Mac Dermot, 1996. All the best, Mike. Hi June – on the Barrys – they were a Norman family who settled in Munster, mostly in Cork. And intermarried with the Gaels over time. There are a HUGE amount of Barrys around Cork – just check out the 1911 census at http://www.census.nationalarchives.ie (search for surname Barry). Mike. Could you tell me where castles connected to the Coppinger are located, who built them and when, and how I can find out more information. Thanks. This is so interesting reading the comments from people who can trace their ancestors so far back. I was all set to go over and claim my castle but sadly none of my immediate family name were on there. Oh well I will try to recover. Thanks again Mike for all you do. Best Wishes to you and your Wife. Patricia. P.S. I see O’Farrell but that is my Husbands name. Have another look Patricia – I seem to remember “Sullivan” is one of your family names (O’Sullivan) Mike. A fantastic experience Jude – thank you so much for sharing 🙂 Mike. McGrievey/McGreevy is a name from the county Roscommon originally Claire. Mike. p.s. been told the maternal (Watson and/or Hannan) side is from County Limerick, but have not confirmed. 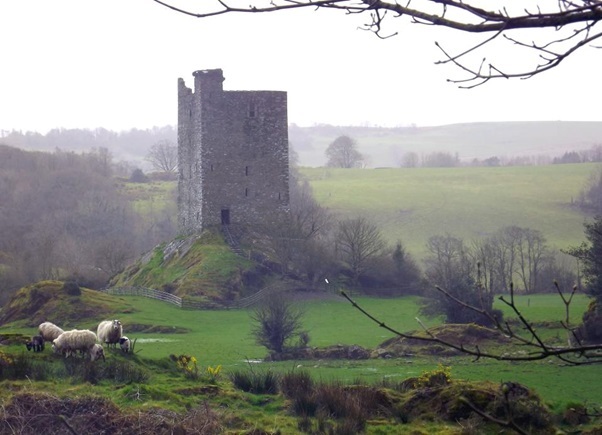 Hi Maureen – The O’Reillys were county Cavan (Breifne) – where they had up to seven castles. I’ve added all your names to our list. The spelling for Hannan is usally Hannon. Mike. Ballinlough Castle was an O’Reilly castle till around 1800 when due to a n inheritance the family name was changed to Nugent to retain a title. They are still the O’Reilly bloodline despite being named Nugent. Can you confirm this or point me in the right direction to follow this up please? Hi John – I did not know that. Thanks for the info, Mike. I think I have Nugents from Wexford in my family tree. Do you have any family info about them. Hi John, your information is spot on, the name was changed to inherit a legacy in 1812. They are almost unique as a celtic catholic family who retained their religion and have lived in their ancestral castle, since they built it. The present castle incorporates the original O’ Reilly castle. They are responsible for the term ‘The life of Reilly’ as they were a very rich and powerful clan. So rich that the limited coinage in use at the time was called ‘a Reilly’ or more correctly in times past a Raghallaigh. Hi Debra – great to hear! And if you want to sign up for our free “Letter from Ireland” (see http://eepurl.com/xPw4P ) you are welcome also! Mike. Other names in my family-Joyce,Shea. Hi Pat – Ightermurragh Castle for the Supples in County Cork – have a look at http://www.britainirelandcastles.com/Ireland/County-Cork/Ightermurragh-Castle.html All the best, Mike. Hi Joanne – names now added to our list. On your question – its kind of true. Roscommon was known as Connaught before – the name Conorton comes from the word Connaught. Would you be able to tell me where the Molloy or O’Molloy castle is (was)? Hi Jennifer, Molloy castles- there are a few including Pallas and Killooly in County Galway. Mike. The Offaly sept was in Broughall Castle just outside Kilcormac on the north bank of the Silver river. They also owned Eglish Castle and Ballyboy Castle. Eglish is the only one that has anything still standing. Thank you for this list! Looks like both sides of my family liked the castle life – the Blake’s and McGrath’s. I know about Menlough Castle in Galway for the Blake’s, but where would the McGrath’s have resided? McGrath Castles = Sleady, Abbeyside and Mountain castles. Mike. What about Leslie castle ? I didn’t see it listed? Hi Lisa – Castle Leslie is a manor house built in 1870. Mike. Hi Chris I’m Joanne. My grandfather Llewellyn Nesselrode Gamble his father born in Ireland Washington Henry Gamble came to PEI where my grandfather was born . I’m looking for any info on any Gamble family related to them that are still living there if you can help please reply. Thank You. Joanne Conorton. The name Llewellyn is Welsh, so there are Welsh connections somewhere. It isn’t found anywhere else but Wales. Hi I’ve been helping a friend trace their family tree, their name is Casey. I see there is an O’Casey on list and was wondering if it is possible that they dropped ‘O’ when or before they moved to Scotland then into England. Hi Karen – Casey and O’Casey are one an the same. Mike. I’m looking for any information on the surname of Farry. I have been researching my father’s family for quite sometime and can not pin point where they are from in Ireland. My third great grandfather and his family came over between 1850 & 1855. His name was Michael Farry. Any help would be greatly appreciated. Thank you in advance! Hi Teresa, Farry is usually from around Sligo/Mayo/Leitrim. Mike. I see the name McInerney in your list of castles or castle sites. Is that in County Clare? That name became McNerney and then McNerny which was my maiden name. We know the family was from Clare but don’t know where. Don’t think my branch ever had enough pennies to afford a castle. LOL They immigrated in about 1850. Thanks for the information. It is indeed Pat – one is Dromoland Castle. Mike. I have a photo, taken by my Aunt, of Derryhivney Castle. The structure is situated about 3 miles north of Portumna ( County Galway) and within a mile of the West bank of the River Shannon. The story is that it was built by Daniel O’Madden, Lord of the Territory, in 1643. Do you have anymore info on this castle? I noticed that the oneill name is on the list.can you tell me more about it.thank you. Famous family in Ireland Arthur – just google “o’neill clan” to see what I mean. Mike. Mother’s maiden name was HANLAN. back a generation was a relative, Ned Hanlan, the world champion oresman. Boy in Blue movie , mid- eighties was his life story, with Nicolas Cage. Mother’s family originally came from Ireland Can you direct me to researching their family?? Very interesting Shirley. The name Hanlan/O’Hanlon comes from County Armagh originally. Mike. Shirley. I wonder if Ned’s family are connected to Hanlon’s from Longford. The name Edward runs back many generations in our family, and pictures of Ned Hanlan show a striking resemblance to some of my cousins. An Edward Hanlon settled in Ballymahon circa 1775 and there has been an Edward somewhere in every generation since, so a connection is at least plausible! Could you please tell me where the O’Kelly castle is located. There’s a few in Galway/Roscommon Robert – such as Moyvanan, Garbally etc. Would like info on where the Jones castle or tower house is located and if it is still standing. Hi Beverly – Jones castles are Bellaghy and Salterstown in County Derry. Mike. Can you tell me where the Phillips clan would have had a homesite? I have no idea of where they were from only that they were part Irish….The other side of my family is King from County Cork…..
Did the Grace family have more than one castle? Also do you have any information, or a picture would be great, about Castle Jordan in Kings Co. owned by the Gifford/Giffard family? Thank you. Try Googling Castle Jordan and County Offaly. On Grace – there were 2 or 3 castles Ballylinch and Legan. Mike. I see Roche listed…my mother-in-law’s maiden name was Roche and she was from County Cork. Where would we find their castle? 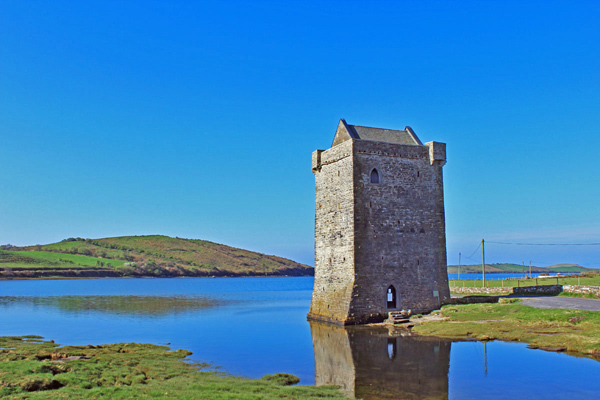 There were a few Roche castles – start by looking at Blackwater Castle in County Cork. My mom is from the O’Conners (O’Connor) and the Dhority’s (O’Doherty) in Ireland. Are there any castles still standing and where in Ireland? I am so intrigued by all this information! I know the Doherty name goes back. Hi Donna – there are different O’Connor families in Ireland. I see McDonagh on your list – where is that castle? My family spelled it McDonough – would that be the same family? Usually the same Kathleen, try Castle Dargan. Also I have found through the US census that the way we spell Dhority was actually spelt Doherty at one time. We do not know why the spelling was changed to Dhority. The O’Connor name for us also got changed in spelling to O’Conner at some point. We found that we are related to Princess Diana (waaaaaay) down the line on the Spencer side. Hello, just came across this post on FB. I’m going to sign up for your newsletter too. I have leads that my Cole family may have been from Ireland, or at least lived there prior to immigrating to the colonies ca 1700. I see COLE on this list. Can you tell me the locale for Cole’s and/or their castle? Hi Christie – the Coles had Portora Castle in Fermanagh. Mike. The McCabes had a castle in County Cavan, but fighting on the side of the Catholics in the late 1600’s didn’t work out so well for them. The ruins are now a community centre. My family name is Ferrell, changed from O’Farrell. I know my ancestors arrived somehow in SC and started rice plantations. Can you give me any info??? Maybe??? O’Farrells were from Longford Marty – which was named after the family. Some Farrells are called Ferrell in Ireland also. Mike. Hi Mike, what a great website you have! I have never been to Ireland but I plan to in the future. My grandfather and grandmother came to the states by way of Canada. I know my grandfather’s family Lynch are from county Cork.. but would love more info. Would you be able to tell me about their castle where built and how to find it? My grand mother’s maiden name was O’Shannahan if you would happen to want to share with me maybe a website or anything I could use as a jumping off point, I’d be eternally grateful.love love your site, always brightens my day! The Galway Lyches (it comes from a number of different counties) had Lynches Castle in the centre of Galway town. Shanahan came from Clare originally but spread into many counties of Munster. Mike. Lynch family always a tricky one, but I can help shed some light as I am a ( Galway) Lynch though my great grand mother. There are two Lynch families. The native Irish clan O’ lionsigh which means mariner/seafarer. They were based along the south west, up to sligo, all coastal. One branch of the clan settled in Co Cavan which is an inland county. The Lynches (de lench) of Galway arrived with the first wave of the anglo/norman invasion of Ireland..they settled in galway and were mayors of galway for centuries. Because both names at the time would have sounded very similar to the ear…both families ended up being anglicized as Lynch. If it helps, the Galway Lynch’s stayed in the GaLway/Mayo area. As Mike correctly states Lynch’s castle in galway city. This was the family’s Town house and their first. they also owned Barna house, and Party House in Co. Mayo among others. Hello! I would love to know if you could tell me where are the Mulvihill´s castle are located? Thanks!! Hi Guillermo – Mulvihill was originally from Roscommon but has since spread over many parts of the island. Mike. 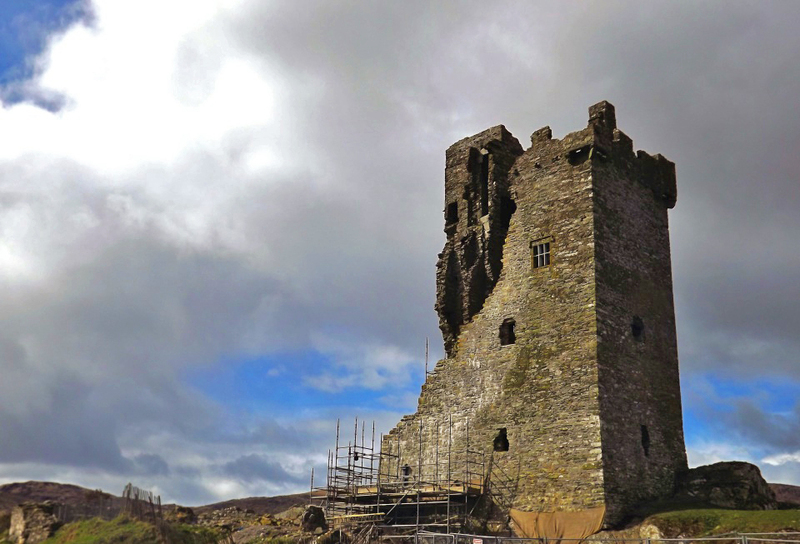 Hi Guillermo – Mulvihill is Doon castle in Clare. Mike. Mike, We have been told that the Castle at Togher in West Cork near Dunmanway was an O’Connor Castle and that after some upraising our O’Connors ended up living in the shadow of the Castle at Togher. k Know anything about this??? Not sure about that Margaret – that castle was a McCarthy castle – I know it well and visited a few months back. Mike. Hi Trudy in Antrim/Armagh it is usually an English name that arrived after the 1600s. Mike. Hi Win, try Barnaderg and Galey castles. Mike. I saw the name Gray listed here- do you have any information about them? I don’t think I am related to any famous or wealthy relatives, I think my great grand father may have come from Antrim, and was a tenant in Ballymena. I’m not 100% sure he is my relative, but he is the only Benjamin Gray I can find in Griffins valuations. Any information you can give me would be interesting! Hi Pat – in Antrim, Gray is normally a Scottish name that arrived in the 1600 plantations. Mike. My great great great grandmother was a Ryan. Mary Ryan married to John Gilhooly. They came from Tipperary but from what I am seeing moved to Leitrim sometime after my great great grandfather and his sister were born. So I’m not sure if Mary is from Tipperary or possibly originally from Leitrim. How would I tell if she was from the Ryan family mentioned here and what castle did the Ryans build? Thanks. Ryans came from Tipperary – Gilhoolys from Leitrim. Ryans castles include Cragg castle. Hi, Mike! Could you tell me where the O’Casey castle would be located? My husbands ggggggrandfather Abner Brooks Casey was born around 1700 in Tyrone, Ulster. He came to America around 1725. I was fortunate enough to spend a week exploring In Ireland last year. I absolutely loved it. I am hoping to return on a longer trip next year and would love to visit a “family” castle! Thanks! Where would the Brady castles be? Brady = Tonymore castle Roxanne. Mike. I didn’t see the name Gormally, O’Gormley or O’Gormghaile, but I had heard that they were Chieftains in the time of 1100-1300. You seem informed, so I was wondering if you had any information about this family. The information is that the last Gormally who remained in Ireland was Michael Gormally, who married a Mary O’Dowd in/near County Sligo around 1800. Hi Mike – The Gormleys were from County Roscommon/Mayo area originally. There are seperate Gormleys from Donegal/Tyrone also. Mike. Hello. I don’t see the name Comerford on here but research tells me they originally built Ballybur Castle. We’re planning a trip to Ireland for 2015 and hope to stay at least one night in this castle! I’m researching our family history now and hope to trace it all the way back to Ireland (we’re in Canada). And Kilbline castle in Kilkenny also Donna – which is in great shape! Some names are left out at the moment, but things will correct over time! All the best, Mike. Hi. Could you tell me where the o’callaghans castle is or was located. Never knew this and been researching for a couple of years now. Dromaneen and Clonmeen Castles in county Cork. Hi..and thank you for all the lovely information. Do you know where and which castle the O’Hagan’s built? Wow, I see 5 different surnames from my family history: Drummond, Stewart, McNamara, O’Hara, and Tierney. Tierney is the closest since it was my mother’s maiden name. From where in Ireland do most Tierneys come? I have yet to find where in Ireland my third ggrandfather emigrated. Hi Jane, Tierneys can come from either Donegal, Mayo OR Westmeath. Mike. Hi I was wondering were abouts the savage and Reilly castles are? Reilly: Kilmore and Mullagh castles. Donnelly castle is Castle Caulfield. Mike. McGrath can be from Waterford OR Clare OR Donegal/Fermanagh. Check out Sleady, Abbeyside castles. Hi Mary – names now on our list – thanks for sharing and your feedback. Mike. -love a jumping off point to start. Thanks. Prendergast is associated with Enniscorthy and Rathtimney castles. Phillips is associated with Doo castle in County Mayo. Mike. Just wonder if the name Kenney is associated with any castles. Maybe no castles, but your surname derives from the Ó Cionnaith sept. The name means ‘born of fire’ The sept were traditionally based in Galway/Roscommon. In english it gives us the surname Kenny, and the christian name Kenneth. One bearer of the name Cainnech of Aghaboe in english known as St Canice (old english for Kenneth) gives Kilkenny its name. In irish Cill Cainnech. Kenneth’s Church. What a fabulous list–thank you! I am going to share this with my Irish Genealogy group tomorrow. Most of my family names are not on the above list (they were mostly farmers): DORAN, CRONIN, CORCORAN, CONNERS, McCANN. I am interested in any info on DONNELLY you might have. I can not get them back over the pond. Hi Mary Alice – Donnellys were from Tyrone originally. Castle Caulfield is associated with them. Mike. My grandfather’s family is from Ireland though I don’t have much information. Can you tell me anything about the castle the Whites built? Hi Tusha – there were a few Whites in Ireland. Clongill, Gorr, Ballyhealy in Wexford are White castles. Do you know anything about the location for Burke? That is my husbands family name. They had the most castles in Ireland Bethany – all over the counties of Galway – just Google Burke and castle! Mike. Hi Mike, Any chance you could tell me about the McHugh castles? What county or locations? McHughs did not have any castles associated with them I’m afraid. Mike. Yes, the McQuillans are on the list. They lived in the Dunluce Castle in Antrim. I would be interested in knowing about the O’Rourkes too. Where is there castle located? We also have Conwells, Heffernans, Laughlins, Quinns and Tierneys in our line. Hi Pat – if you Google “Rourke” and “Leitrim” you will find out all you need to know! Mike. Hi Mike, I noticed my family name Dunne on the list, could you tell me the name and place of their castle so I could look it up? Many thanks. Hi Susan – Dunnes were in Castlebrack and Ballinakill castles. Mike. Hi Thelma – thanks for sharing those names. Letter details are below. Mike. McKunes or McKeons and Horrigans from the south of Cork. Any ideas where we’d find them? Costello castle is Edmonstown, Glebe and Mannin Castles. McKeown is from Antrim or Roscommon/Sligo. I come from a line of McLaughlin. I took my mother to Ireland 2 1/2 years ago. Most of what we found were McLoughlin. I would love to come back soon. Where is the McLaughlin Castle located? McLaughlin castles are Red Castle and White Castle in Donegal. Hi Mike! I noticed my family name was on that list. Could you tell me if the O’Casey castle…the part of my family I was named after is still standing and where? I’ve love to take my husband and kids there to visit one day! Our Irish family names are Byrne and Johnston. Do you have information about castles they may have built? My husband and I were recently in Ireland and we stayed the night in Ballytarsna-Hackett, a 15th century tower house which has been beautifully restored. Johnston was a planter name that came to Ireland after the 1600s – mostly to the counties of Ulster.One family is associated with Magherameenagh castle. My mother’s father’s side of the family were Brady from Ireland. I see you have that name on the list of castles. Would you be able to tell me where in Ireland and when this castle would have been built! Also if you know can you tell me if it still stands! Thank you so much for all the work you do….this is amazing!! It does! Tonymore castle in County Cavan. Mike. Fascinating. Truly. My family has since just begin to dig up our genealogy. I would love to know what region Dowling was. Love to research and love to visit! Brynlee – Dowling was from County Laois (Queens COunty) originally. Mike. My husband has been told that his family came from County Cork, McDonnough, I am wondering if the McDonagh on your list is the same clan? Hi Charlene – the ancestor may have travelled from Cork by boat but McDonagh is more a Galway/Mayo/Sligo name. Mike. I know that my Brady ancestors immigrated to Canada around 1842. They came from county Armagh. I was always given to understand that they were not overly well off. Now you tell me there is a castle!!! Hi Jackalyn, try looking up Tonymore castle. Mike. I see McGovern listed. My great grandmother was Mary Alice McGovern, born in Kill Townland, Cavan County in 1857. I’ve not been able to find any information on her or her family. Any chance I can find something through links to a castle? I’ve tried just about everything else. Just come across you website and found it very interesting. Have had no success finding my Martin Crane/Crean who was born about 1845 and was in England by 1871, on one English census it says he was born in County Mayo. Also a McKnight. Any information on the surnames? Crean can be Donegal/Sligo or Kerry. McKnight can be be of Scottish origin or of Norman/Gaelic origin from Westmeath. Mike. There were a few May – start by looking up Browns Castle. Mike. Would like to know where my ancestors came from. Father’s parents were Michael Harding, Catherine Lalley, Mothers Parents were Margaret Harrison and James Harrington. Can you shed some light what counties they came from? Harrington:Cork or some counties in Connaught. Where can I find out where O’Hagan Castle or Castles were located ? Magheraglass castle for the O’Hagans. Hi John – the area south of Kinsale in Cork is known as DeCourcey country. There are a few DeCourcey castle ruins in the area including the Old Head of Kinsale. Mike. Nee is a Connemara name from the Irish Ó Niadh – plenty of them in Galway. Inishnee near the village of Roundstone is named after the family. Mike. Family tradition has it that our Protestant STANLEY family came to Ireland as four brothers who were skilled labourers … With Cromwell. Do you know how I may be able to find out more about this ? Also my 2xGr grandmother was a Skerrit…. Do you know anything of this name? Love your info. Have stayed in Ballyseede Castle …. Wonderful. I saw my family name on the list. Could you tell me where in Ireland the Tobin castle would be found? I believe my ancestors came from County Cork. Hi Marian – Tobin castle was Killaghy castle. Hi Louise – O’Connor can come from a number of distinct places in Ireland so you need to get the records to trace back to a location. My husbands maternal family Casey, and we have traced that line back to before they migrated here to Canada. My husbands fathers family also migrated from Ireland and settled here in Canada as well. Can you tell me where the O Casey castle is? The ruins of the Magner Castle still stand! It is an odd and somewhat rare Irish name. It arrived in Ireland with William the Conqueror, and is really a Norman name originally. I was always told that all Irish Magners are one family. Charistically, they are all very “small boned,” petite…….I wear a size 3 ring! Also, they are usually short, under 5′ for women and men are not much taller! A chin dimple and Snow White hair at a young age complete the “Magner” picture!! We can thank Oliver Cromwell for leaving the castle in ruins……….just a bit of a tiff about some sort of Catholic uprising…….LOL! The Ryan and Mooney families are my Irish connection. I believe the Mooney’s hailed from Roscrea In Tipperary.. Can you tell me what castles they may have inhabited? Thanks! Hi Mike, I didn’t see our name on your list but I know the name could be spelled differently; O Corrain, O’Currin, O’ Curren, Corhen & Curreen. Could you please tell us if they had a castle & where. Hi June – no Curran castles I’m afraid! I was wondering what you could tell me anything about a castle for Griffin? I know my gfather was from Rosmuc in county Galway. Could you please tell me the location and names of the Quinn and Keane castles. I know Quinn is a fairly common name in Ireland and I have traced my line to Limerick I think! My wife’s family is the Keane line and family rumour has it that they had something to do with Waterford. Keane = Scattery island, Kerry. Hi, my great great came to Canada from Mothel county Waterford in 1820 . Are there many Fitzpatricks in that vicinity? I am trying to trace back my ancestors and do a family tree it is very time consuming .. A little help on this and maybe the castle they belong to ..I would be grateful. Hi Callie – Hearne is normally a version of Aherne found in Waterford. Mike. Hi. There is a surname in my family on my Late Mothers side of Moon. I’ve always wondered if it was Irish. Any help you can give me would be appreciated. Usually a version of the Irish name O’Mohan Treena. Mike. I was curious about the castle for the MacSweeney clan. Where it is and the story behind it if possible. Hi Becky – the most famous McSweeney castle is Doe castle in DOnegal. Start by looking that one up. Mike. I am just starting to look into my Irish heritage. Apparently we are descended from the POWER family and possibly O’DONNELL, and WATERFORD (not on list). I noticed their inclusion in your list. Are you able to tell me where those castles are, or the castles names, please? 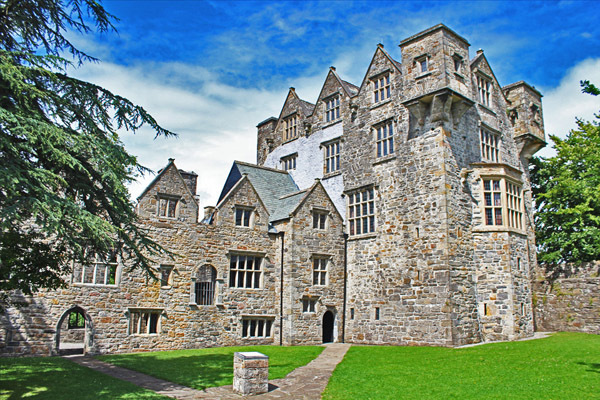 Hi Rachael – Power castles in County Waterford and O’Donnell castles in County Donegal. Mike. Now on the list Marlene. Mike. I see the name O’Clery is there I unserstand that is also Cleary. Can u Reply? Hi Eileen – one and the same! Mike. Hi Terry – For help on tracking specific people, I suggest you contact Noreen at http://www.hiberniaroots.com Mike. Hi Mike, what an interesting site. We have been working on tracing our family for many years. We visited Tullynully castle a couple of years back. We got to walk the gardens and had a tour of part of the castle. Packenham’s still live in the castle, but know little else about our family. Just Google Burke and Connaught and you will see a lot about the Burkes of Connaught. Mike. We are O’Hynes and visited the Dunguaire Castle in the Galway area last summer that they said was built by the O’Hynes clan for the (last?) King of Connaught. They had a wonderful little booklet but it was their only copy, I’d love to be able to get one, that told some of the stories. We have traced our relatives to the Ballycumber area of County Offaly. Is there any information about how and why they moved from the coast to the inland? Maybe up the Shannon? Other names in the family are Maher and McLaughlin. Interesting site, thanks! Hi Sally – many Irish Gaelic families were moved around the country after the 1600s. It was not always their choice. Mike. Stacey – Sinnotts were in Wexford. Lots of info and castle details here: http://genforum.genealogy.com/sinnett/messages/127.html Mike. I was amazed to see my family name there. I did not know there was a Savage castle in Ireland at all. How can I find out more about this? Jo Anne – Savage in County Down – Ardkeen, Kirkistown and Portaferry castles. Look them up! Mike. Hi Mike!! I am related to Parnell’s from England, please tell me they were in Ireland at one time! I have other Irish ancestors, but would like to think my Parnell’s were there also. I visited in 1996 with my mother. Best vacation I ever had!! Hope to come back next year! My maiden name is McClendon. Anything on it?? 🙂 Thanks for all your work! Sharon, Charles Stuart Parnell is a very famous Irishman, from Avoca in County Wicklow. Mike. Pat so very interesting! Are there any McDonnell castles? About 7 castles around County Antrim. Mike. I didn’t see any family names on the castle list, but I was wondering if you could tell me anything about some of my Irish families. I know that one family came from County Meath, but I can’t remember which one. One family name is Ferguson and I was told that they fled Scotland after the first Jacobite war, There was also Leedoms who came from England, My one ancestor was called “Irish John” Leedom. There was also a family with the name Lee which supposedly came from Ireland, and then there were the McVays. I also have Welsh and English. My mom’s ancestry is purely from the British Isles. Dunn is my married name and the family actually spelled it with an e that got dropped along the way. However, my husband was adopted and is a mix of German and Polish. All my life I have felt such a strong pull toward Ireland. My mom would often tell us that we were screaming like a bunch of “banshees ” and that we scared the “bejesus” out of her, so there must be some link. Thanks for your help! Hi Theresa – lots of potential links in there alright. Dunn(e) is the only name that is typically from Ireland originally – the others typically belong to planters who arrived after the 1600s. Mike. I see the name Grant my mom’s dad was a Grant. Do you know the area the family would be from. Also his wife was a Bonar which I was told was Scotch or Irish. Do you have anything on them? Thanks for all your hard work and the information that you are providing. God Bless. Hi Linda – Bonar is typically Irish from County DOnegal. Grant would be a Scottish name found in Ireland. Thanks for the kind words – Mike. I’ve heard it told that some members of my Dad’s family were known as McHenrys, though the last few generations have been known only as Henry. Nonetheless, I’d love to know where it is, for our next visit to Ireland! Hi Lynne – Ballyreagh castle in County Antrim – now only a ruin! Near Portrush. Mike. My surname is foxe! Can you tell me more about it, where it originates from and why do we have ‘e’ on the end of it.? Hi Pete, Foxe in Ireland is mostly from County Meath. E’s were added and taken to denote more/less Catholic for a period and other possible reasons. Mike. My mother’s father was William Donal Patrick Albert O’Grady born in 1885 in Devon, his father was a Patrick O’Grady born (I believe) in County Clare…..I can’t find anything further, any suggestions? Hi Siobhan, For specific record searches, you may want to contact Noreen at http://www.hiberniaroots.com – she should point you in the right direction. Mike. And to think I was under the impression that the O’Neills were all poor farmers! Any info on where they were from in Ireland? I’m just starting my research. Thanks for your work! Hi Lisa – far from poor farmers – lords of much of the northwest, for the main O’Neills. Also other different O’Neill families throughout the rest of the country. Mike. My great-grandfather was a Cassidy who came to America and settled in Pennsylvania. DO YOU HAVE INFO ON THIS CLAN? I thought Netterville major was built in that timeframe. Is it not a castle and that’s why it isn’t on the list or is my timing off? Thanks for your feedback! Hi Abby – not all castles included yet – thanks for the note, will update. Mike. Hi Liz – glad you like the site. For specific record searches, you may want to contact Noreen at http://www.hiberniaroots.com – she should point you in the right direction. Mike. I’ve been doing family tree research for some time now. But I’ve yet to come up with my ancestors name Corrigan. I know my Great Grandma was born in County Cork in 1861. Hi Jeanine – Corrigans were originally from Fermanagh – but spread throughout the country including Cork. Mike. Hi Mike! I’m just starting to explore my family’s ancestory and am dying to know more. My last name on my dad’s side is Mitchell, but for some reason always thought it was more Scottish. Any info you have about Mitchell would be great! My family name is on your list as O’Mannion. Could you tell me where they are? Hi Michael, O’Mannions came from east County Galway originally. Mike. Thank you Mike. Are their castles located there also? Check out http://www.mannionclan.org and http://www.facebook.com/themannionclan for some information on the Ó Mainnín/Mannion Clan of Co. Galway. In the 16th C, the Mannion Clan held two castles, of which nothing now remains but the footprints. Interesting Joe – my mother was a Mannion. Mike. We have researched our paternal branch of the Forrest family coming to Canada in 1846 from New Deer, Aberdeenshire, Scotland for most of our immediate family members (my great, great, great grandfather) . Other branches of our family went to Australia in 1842, one being the father of Sir John Forrest. The name is considered to have a Norman – French origin, with all derived from “extensive wood”. Our family motto is Vivant dum virent – They live as long as they are green. The crest is usually three oak trees and is in stone on a wall on Forrest Road in the City of Edinburgh. Going back as far as the 14th Century in Scotland, there is mention that possibly earlier, deForrest, Forrest and Forrett members immigrated from France . Later in time, it is noted that many left Scotland and went to Ireland, mainly in Dublin. I noticed Forrestal being one in your list. Can you tell me where that family castle is located and it’s year of build? John Forrest was also Lord Mayor of Dublin. Thank you for your interesting list. My mother and daughter will be going to Ireland and Scotland this Spring 2015 and while they may not see this castle, they will have some amazing memories of where our ancestors may have once roamed. My maternal grandmother was born in Edinburgh and played along its castle’s shadows – that at least is one place they will get to see and know a family member once walked. Very interesting Jeannette – thanks for sharing. The Forrestal castles are Knockane and Kilferagh castles in County Kilkenny. Mike. Noticed the Redmond name as one clan who built a castle. Can you tell me in what city or county the Redmond’s built their castle and whether it’s still standing. Loftus Hall and Clohamon castle in County Wexford, Deanna – Mike. My daughter in laws part Irish and their family name is Williams – her mother came from County Mayo – they do not appear on your list is their anything on the Williams side. Williams now added to Mayo list Dorothy, Mike. Could you add Eager’s to the list? Thomas Eager come to America in the early 1730’s from County Monaghan. I’m not sure where exactly, that’s next on my list:). Hi Cyndi – now added – Mike. I would be interested to learn of any McGorman castle. Our Gormans emigrated from Dublin to Salford, Lancashire about 1873. My great-uncle John (Jack) used the O’Gorman version of the surname. Hi Ken – although Gorman was Mac originally, it got re-worded as O’Gorman in the late 1800s – and it is still called that today here. Check out Cahermurphy castle in County Clare. Mike. Can you tell me anything about the Tuohy family from County Clare. My grandmother came to the U.S. And met my grandfather in Chicago. Hi Annette – O’Tuohys came from Galway originally but moved enmasse into north Clare. Mike. Ryans in Wicklow are often the Carlow O’Ryans. The Ryans we know nowadays are usually the Tipperary Mulryans – now shortened to Ryan. The 3 Ryan castles would be the Mulryan ones. Mike. I just found out who my great-aunt married (searched her maiden name-Cochrane) and she married Robert Johnston in 1861. I thought that was an “odd” Irish name and now I see it on your list! Any info? They were from Castle rock area-as far north as one can go. Lots of Johnson/Johnston in Ulster Ann – there since the 1600s. Hi Teresa, extra names added to list. Pendergast is an alternative spelling of Prendergast. Mike. Have the surnames Mulvihill and Reidy within my family tree. You have Mulvihill listed so would love to know where the Mulvihill surname originated and to which castle it is connected and where that would be situated . Anything on Reidy? Thank you for your great website and Facebook page. Hi Christina – Reidy is from county Limerick. Mulvihills had Doon castle. Thanks for the feedback, Mike. I never knew there were so many castles in Ireland. Having been to beautiful Ireland, I sought out the castles & love them all, especially the ruins. My grandmother’s family is Boyle and arrived in this country in early 1800s . But it never occurred to me that the Boyles may have had a castle. Can you provide some information or a link for me to explore? And thank you for a very interesting reading. You are a breath of fresh air– someone who shares their research freely. I am grateful. Like Kathleen’our ancestor, Neil Boyle (O’Boyle, OBaighill) came to the U.S. around 1835 from Donega – Inver Parish. The Boyle Doon Fort is near Ardara in Donigal. The Boyles had the castle on Loch Eske in the 1300s, later taken by the O’Donnells, then lived in by an English family, vacant for many years, recently renovated as a beautiful hotel on Loch Eske. There is an of town, Ballyboyle near Dnegal Town on Inver Bay & Ballyboyle island on Inver Bay. If you get to Donegal Town, take the waterbus tour on Inver Bay. Thanks for sharing susan. Mike. By chance are any of your Boyles or O’Boyles related to any Fallon’s? Thanks for the great work you are doing. My husband’s family is from County Monaghan . The names Frawley, Kehoe and Starr are in his line. My Mother was a Dolan and the names Dynes, McComisky an O’Keefe are associated. My Dad has the names Johnston and Cross in his line. Is the name Crosse associated with Ireland? Hi Nancy – Crosse is an English name but can be a variant of McCrossan. Mike. Wow you have such clarity with your research! So refreshing. We were from MacSweeny and wound up muddled with Greggs, possibly in America. Thanks very much Mary – gad you are enjoying it! Mike. My surname is English of course thru marriage but my maiden is Day which I have been told belongs to the O’ deas I have never verified this. Also I would love to know where the Griffins come into this. Bless you for what you do it’ s not easy trying to do this alone. Hi Anne – Griffins are from County Kerry mostly. Day is typically O’Dea alright. Mike. My paternal grandfather grew up in Oran Castle, in Oranmore, Galway (Walter Blake family), and there are several other family names on this list. But, I’m wondering if anyone has heard of Bella Manor? I don’t know that place offhand Randy. Martin was a number of different seperate families. This article has generated lot of comments, Who doesn’t want a castle. Looking to trace the Flynn’s in Sligo. My ancestors moved from Ireland to England mid 1800’s Can find them in in census of England but can’t find them in Ireland. Any hints where to look ? Maybe in the basement of our castle. Cheers ! Hi Terry – I suggest you contact Noreen at http://www.hiberniaroots.com for a records question. She should point you in the right direction. Mike. Looks like my husbands name Daley is part of the O Daly family can you tell me where their castle is? Thanks for the info this was great! Castledaley and Killimer castles in Galway Janae. Mike. Jordan comes from “Jordan country” in County Mayo Jon. Mike. Hi Mike, as usual always a pleasure to come spend time on this website. How about Keating, any idea where their castle was? thanks! Hi SOnia – Keating castles were in South Tipperary and north Waterford. Mike. I have traced my family back to my grandmother’s maiden name of McGrath. I have been unable to go back further at this time, but I am working on it. I am familiar with our connection to Brian Boru’s brother Aherne, but is there more intimate information that I could find, more specifically related to McGrath and less about the Obrien’s heritage. No offense, to them. =) Thanks, of course about the castles. Hi Kathleen – McGraths were poets to the O’Briens and a branch also set up in Waterford. They had Abbeyside, Mountain and Sleady castles. You should pick them up on Google. Mike. The O’Casey name is on your list. Can you tell me which castle would be associated with them? Thanks! Rathcannon castle in County Limerick Sue Anne. Could you tell me anything you can about Myles from Northern Ireland? I have them at County Fermanagh. I also have Leith living in County Fermanagh in Northern Ireland. My family includes Dunn and Dohan. Proud to be married into an Irish family. Hi, Mike, love your site. My maternal grandmother was a Condon, married a Hart. They are both on your list. Any idea where the castles connected to these surnames are? Thanks for any assistance. Love your website. My great-great grandparents came to Canada in 1840 from Ballyheigue, County Kerry. Family names are Hourigan and Cantillon. Can you tell me any information you have. In particular where the Cantillon castle was situated and if there are any pictures? Thanks. On my trip to Ireland in 2002, I found that a castles in Co. Cork at Ballyhooly, Castletownroche: Blackwatre Castle and Glanworth , were associated with the Roche family. My Roach ancestors left Ballyhooly, Co. Cork for America in 1850. They were located in a roughly triangular pattern on the map. Wish I could post some photos here. In my last post, I meant to say “The castles were located in a roughly triangular pattern on the map.” and not my ancestors! I found two family names here that were castle dwellers. I knew about the Kirwan’s , but see McGovern – my mother’s side, as well. My mother was a McManus. I have had a hard time learning much about them, but see on this site, they were Vikings. Where was the McGovern castle located? Very helpful info – Thanks so much. I am taking my family to Ireland the summer of 2015. I’m first generation. My mother’s family is O’Brien and O’Connor from Inniscrone,Sligo and my father is Kelly from Ballenlough, Roscommon. I would love to visit Castle sites with my grandchild. Also, I am stuck on finding my ancestors prior to the 1901 census. Any hints would be appreciated since the names are all very common. Thanks in advance. I’m enjoying the site and signed up today. My maiden name is Higgins. My uncle went to Ireland years ago and brought back what is our link to Bernardo O’Higgins. My grand-daughter is doing a report on my side of the family. My question is this. Is there a castle that our family lived in? I have been told over the years that there was and now i need to know for sure. Also, my mother’s maiden name was Hurley and her grandfather migrated from Ireland. I am trying to trace my ancestors. My great gradfather came to Canada in the 1900′ and settled in Ontario. My DA told me we come form County Cork and our family has a long list of reletives in all parts of Ireland. A friend of mine who is an O’ Rourke said one of her ancestors married a McLaughlin. I think they were from around Galway. Hi Dave – I see you recently joined the Green Room – welcome! When you are ready, head to the Introduction section and let us know your family names etc. Mike. My mother’s maiden name is Leslie. Her father and grandfather lived on a small farm in Westmeath but my mother believes that the family came from Longford before they moved to Westmeath. I was wondering if there is any possible connection between them and the Leslies of Glaslough or are they most likely descendants of Scottish planters during some plantation? My grandmother (Dad’s mother) was a Doherty and I see the O’Doherty’s are associated with a castle. Can you tell me which one and where. Thanks! Hi Mike. I just started doing research on my family and have found that my 3x great grandmother was Sarah O’Brien who was born in cashel Parrish in 1795. My father always said our family was like royalty and lived in a castel but we never believed him. Is there any chance this may be true? I was hoping Clough Castle would be listed. MacElroy,MacEnroy,McElroy,McElroy, so you see how we can be confused? My great grandmother supposedly tried to come to America and leave her drinking husband behind. It’s said she changed the name. On the other side, I have Bergin, Kerr, and my name Bigelow. What am I ? I see the McNeill name listed but nothing more on the page regarding that surname. What is the connection to this post or area of Ireland? O’Casey or Casey Castle, Barony of Pubblebrien, County Limerick 16th Century. Is there any information on this Castle? I was wondering what you have found about the Rosborough (Roxburg) name. We are from Scotland but then lived in Ireland also. There were castles in both Ireland and Scotland but I don’t see them on your lists, neither are still erect. There are only ruins left at the site in Scotland and I believe a gate in Ireland. Dun Luce McQuillans / Mcquillens? ?? Same Clan? My Mum was a Quillen..
Could you please tell me more about Dillon castle please. My 3rd GGRANDMOTHER was Mary Nugent Delany. She was Baptized Catholic in County Meath in 1800. A sponsor to the record was Elizabeth Reilly. Other was father or uncle perhaps James Nugent. Her mother is listed as Mary Cox. I am trying to establish the link to estate/ castle ties…as both Nugent and Reilly…with O’ in front are names have prestige & or titles attached to them. And I do believe Mary and her family were weather immigrants to America. My great grandmothers name was Sarah McLaughlin and came to America from Ireland. Can you tell me what part of Ireland the McLaughlin’c come from? This is all I know about her. Is there a castle for the llewellyn Gamble family or Gertrude F.C.Scott family or Frank or Anne Eleanor Wilkins family? I think there is a Sugrue Castle, not sure where. My cousins went on a Sugrue get-together at the castle. Hi! Is there anyway I can find information about where the Sextons may have lived…I know they are from the county of Clare but can you show me anymore information? We are going to be visiting Ireland soon and would like to know if there are any existing Daly castles still standing or in ruins. Also, where in Ireland did the clan Daly originate? I was told that our ancestors had a castle in Ireland, Cullen Castle. I didn’t see my surname Cullen on your list. Could my family be wrong? I even have a old map in the 1900’s with Cullen listed as a town. So I was believing that the Cullen Castle could be correct. Thank you, love all this information. Fascinating as always….. My paternal grandfather dropped the “O”….. I believe that the name O’Donghue in the list of names above should be O’Donoghue. I already know that my ancestors lived in Kilaha Castle at Glenflesk, County Kerry. My Y-DNA proves that too. Send me an email Mike and I will send you a photo of Kilaha Castle. I don’t see any mention of the Norman-Irish family of Hadsors (Hodger, Hodgers) in your article. Known as the Lords Of Keppock (Cappoge) in county Louth where the original Castle Moyle was built but no longer exists. John Hadsor built Maghernacloy Castle in Co. Monaghan about 1619-21 (still standing). The family forfeited all of its extensive lands and properties after the Great Rebellion of 1641. Hodgers is the English pronunciation of the original Irish pronunciation of the Norman pronunciation of the family name de Hadsor, or de Háidsioir in modern Irish. My dad had done some research and believes our ancestry is from county Galloway, but seeing these photos, it looks like it may have been County Mayo?? Original surname Bourk. He thought he had found that we have royal ancestry from the 1400’s?? No Wards lived in Irish Castles? I guess we were always broke, lol. I see a few of the surnames in my family that have a castle such as Duffy, Griffin, Burke, O’Shea, O’Clery(Clarke) just wondering how I can find out where to find out where these castles would have been built & if they are still standing. There are 4 Griffin castles…two are Balleygriff and Magowna. I’ll have to look them up to tell you where they are located. The Griffins mainly came from County Kerry and County Cork, but some came from County Galway. They were seated at Ballygriffey castle, Dysart Parish, close to Ennis in Clare. Another family of the name was centered in Co. Kerry, at Ballygriffin, in the barony of Glanarought. There is also the place name of Ballygriffin in Coshma barony in Co. Limerick. The Limerick family may stem from either of these two families, we do not know. In the 17th century O’Griffen was a principal name of Cork and in Kerry. O’Griffin is also found in Cork, and Griffin in Limerick and Westmeath. I am descended from the Griffins of Ballygriffin in Glanarought barony, Co Kerry. They were Scottish Gallowglass in the service of O’Sullivan Mór until about 1600, when they moved to Castledrum near Castlemaine. From there they spread out into Corkaguiny, Trughanacmy and Iveragh baronies. Can you tell me which castle is associated with the Kennedy clan please? I intend to visit Tipperary this year and it would be nice to look up anything connected to my ancestry, whether it be castles or graves! one of my family members has found out that the MacKelloch’s name changed to Killough. Being as small sept they were to the MacDonalds. Is there another way I can find information on this? I do find they were a family in Inverness and again the name spelling was changed to Kellough but in Argyll it was spelled Kelloch. so if we were septs to the MacDonalds, does that mean we wear the tartan of the MacDonalds? Sorry if you’ve answered this before but I saw O’Casey on your list and are very interested in finding more about your research on this castle! It would be a great help. I always understood that the Barry’s came from County Cork…is this the case? My family’s heritage is from the Brady clan, possibly shortened from O’Brady. Family lore indicates a family castle or type of manor house that is potentially in ruins. I have a trip to Dublin planned in a month and would very much like to visit the site, if I can track it down in time. Any suggestions at where to start? Wow!! I was actually looking to prove something in my boyfriends lineage (and this site popped up) but now I see a big part of my family here (Boyle). I’m not quite sure how to read this but I am VERY interested in learning of a castle once belonging to the Boyle family! I will sign up for the newsletter. Thank you for all of this! I am just now dipping my toe in the ancestry pool and trying to learn where I’ve come from so to stumble upon a name that I know is Irish is really exciting for me. I know that my 3 times great grandparents came to the US from Ireland so everything else is a major bonus! I’m looking for information on a castle that was said to be willed to my great great grandfather Charles gray . I don’t have any other information other than families names. Anyone have any links or information they can pass my way ? I know that Lady Joan Fitzgerald was married for awhile to James Butler, the 9th Earl of Ormonde. The Butlers were the owners of Kilkenny Castle. Lady Joan then married Sir Francis Bryan. 1) Did the two of them ever live in Kilkenny Castle? 2) Did any of their children ever live in Kilkenny Castle? I saw the Cantwell name in the listing of castles. Cantwell’ Court near kilkenny. Kilfane is another town, Isee in my records. They were the early settles that came with Norman settleres. the name then may have been de Canteville , also Conteville. There is a carved statue of long John Cantwell with the crest on his shield, In 1066 also came with William th Congueror. Other towns mentioned are Nenage,Drimineer,Lough Derg, in Tipperary. I noticed O’Carroll was not on your name list. Funny since according to records they actually had 40 different castles. Specific castles and buildings which are closely linked to the Carroll Clan legacy in Ireland include Leap Castle, Birr Castle, Kinnitty Castle and Emmell Castle and it is believed that there are up to 40 castles that can in some way be attributed to the existence of the Ely O’Carroll clan. The Carroll Clan legacy in Ireland include Leap Castle, Birr Castle, Kinnitty Castle and Emmell Castle and it is believed that there are up to 40 castles that can in some way be attributed to the existence of the Ely O’Carroll clan. I guess my line was in County Mayo, http://www.aletterfromireland.com/a-story-of-irish-quakers-the-famine-and-pennsylvania/#comment-8853 And we emigrated as Herman Walter Hennessy b. 1859 d. a. b. Louisiana across from Houston, Tx. Do you know a free source of info (even find-a-grave has gone $)? Do you know if the McNamara Clan from County Clan built Dromoland Castle? I know that it was occupied by the O’Brien Clan. Many thanks! I am a proud O’Brien daughter descendant of John Henry Clay, William Crawford and Daughter of John Clay O’Brien. My family came from Ireland to New York City and Georgia and also settled in Arkansas USA. That is about all I know. My Ballew family had/has the Barmeath Castle in Louth County, IReland. I was told that we are descendants of the Callahans of Cashal and that they were disinherited for marrying a commoner Irwin…so maybe there is a castle? Also, have ties to the Harringtons from Stradbally , County Kerry…Any info on them? Wow!!! Castles everywhere! I hope to see the Kennedy Castle in Tipperary next June.. Great info Mike! ???? There is a castle in Kilkenny or tipperary, with a statue of Old John Cantwell in the front. would like to see a picture of it. It may be in another name now, I donn’t kow. Thank you for your help. I also saw that there was a castle for the Johnston family which id my wife’s family, would also like to see a copy of it. I think in Tyrone, North Ireland. Very interesting site Mike. I can trace my paternal line back to the year 1240 to Walter Dovedale of Palmerston, Lord Archbishop and High Primate of Dublin and his son Walter Dowdall (1332) from Drogheda, Louth, Ireland-notes in the family genealogy states that he had the title Sheriff. Hi Mike I saw Brown (I know common) but I do know my maternal Grandmothers name was Brown & her father was 100% Irish! Also I didn’t see McDuffee my last name which my father says his dad is 100% Irish/not Scottish can you give me anything on the Irish McDuffee’ s? like do we have a castle?!! Hi Mike, I know from my mother’s paternal side her father was an O’Sullivan and mother an O’Callaghan, but I only found out recently on her maternal side her great grandmother was a McCarthy as well my paternal second great grandmother was a Byrne. My question is where can I find the details of their family castles. I see my last name there. My research says that Irish Dowdall surname showed up in Dovedale during the Norman conquest. Then went to County Louth in the 13th century followed by building Althumney House near Navan, County Meath. I’m wondering what to consider my official County tartan. What is your take on the Dowdall name? Looking to get a kilt made and want it to be as accurate as possible. Hello my maiden name is Doublin, some relatives say long ago a teacher miss spelt my families last name with a “o” in my lastname. ( As Dublin is spelt without the letter “o” in it). An so, Doublin stuck with the following generations. Just wondering if this a folk or if their is some truth behind this. An if so, is in fact Doublin a residence or royal family of some sort? Hi, I’m doing genealogical research. My 11th great grandmother is listed as “Lady” Grace O’Neil Waters Robins. So many people have her listed as having lived at Dunluce Castle and escaped there to avoid marriage. She was on a ship that shipwrecked and then on another that came to Virginia. My 11th great grandfather was Edward Waters. They married shortly after having arrived in Virginia. He was several years older than she and when he passed away Grace married Obedience Robins. I have found no historical proof that any O’Neil ever lived at Dunluce Castle. The only people I show living at Dunluce were the McQuillan and MacDonnel families. Do you know of any O’Neil living at Dunluce Castle? Grace was born in the early 1600’s. I will be traveling to Ireland within the next year or so. and would like to stay in the Griffin castle of my heritage. How do I contact them? My family name is Hayes. Can you tell me what area they were from and if they lived in in a castle. I really don’t know any of my Irish history so any enlightenment you may have would be appreciated. My grandfather Thomas McElheny got a letter many years ago that he inherited a castle in Ireland if he wanted to come claim it and pay back taxes but he didn’t go. He was in his 80 s or 90s then. It was supposed to be his family castle. I just wanted to see it but don’t even know the county..just that it was in Ireland. It would have been about 53 years ago. “Is your name on this list?” Yes–Redmond. How can I find out more? I’m coming to Ireland in mid 2018 with time in Wexford and would be thrilled to discover the ancestral homestead. Trying to find info on Leitrim Castle in Leitrimmore, Galway. The Annals say the Mac Costello’s built many castles on the west side of the Shannon river system, 1209 CaelUisce in Belleek as an example. Castlemore in Roscommon was their main castle I believe. You are an absolute peach! What wonderful information you have! I hope you might be able to help me. I too, like so many others had a grandfather who inherited an Irish castle. It was in the 1930’s in the midst of the depression so he regretfully declined and the name of the castle was lost. My grandfather was Henry Conolly, my great great grandfather was George Conolly b. 1812 in Dublin. I have been researching for years and have yet to find where George came from. I believe we are possibly hooked up to the Castletown bunch of Conolly’s but can’t figure out which specific family or where George’s castle might be. If you can shed any light on the mystery I would certainly appreciate it. Jenny, The Green Room is where we help with that sort of in depth query. Take a look and see if it is for you. Carina.